In the solar industry, the attention is focused on costs. This goes for the production of the actual photovoltaic modules as well as for mounting system, installation and tracking systems. Bosch Rexroth offers integrated high-precision drive and control solutions as well as mounting systems allowing you to lower your overall operating costs. At the same time, you will strengthen your competitiveness along the entire added value chain. From wafer cutting to lay-up and lamination to transfer – the production of photovoltaic systems involves a number of process steps. For operations to run smoothly, all movements along the production line must be coordinated perfectly. You can achieve utmost productivity with controls from Bosch Rexroth which exchange information in realtime via the automation bus. The consistent operation and maintenance of the systems along with conditioning monitoring and certified safety engineering ensure maximum production equipment availability. Rexroth's proven transfer systems allow for a gentle and vibration-free transport of photovoltaic modules. Mounting systems for photovoltaic modules have to be easy to install, flexible in their handling and durable. 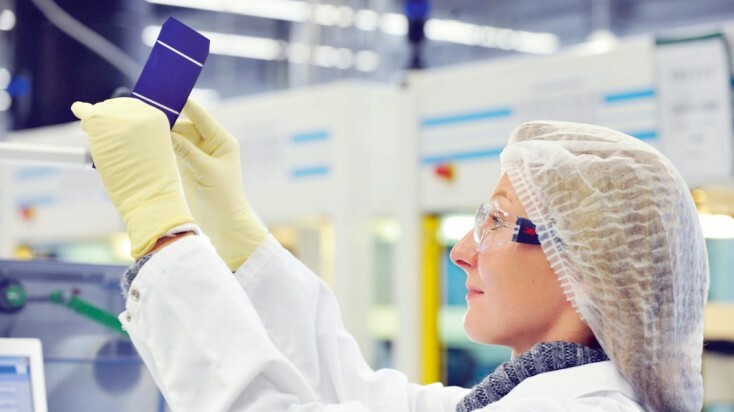 Drawing from 30 years of experience in assembly and mounting technology, Bosch Rexroth supplies base frames and module supports for solar parks with thin-film modules and c-Si modules. Our solutions include a mounting system using the fewest individual parts and a special slide-in system for modules that allows for extremely fast assembly. Solar thermal power plants are often set up in locations such as deserts where the climate is harsh or near the ocean, where the high salt content in the air promotes corrosion. This is also an extreme challenge for the drive components of tracking systems. The reliability and longevity of Bosch Rexroth's automation solutions has been proven in numerous successful projects. These solutions include, for instance, hydraulic cylinders for the adjustment of parabolic troughs that can be switched off between movements, thereby saving energy. Industry-proven switching valves reliably and precisely control the actuators for more than 10 million cycles. Anodized aluminum parts, multi-layer paint-coated steel parts, a dust-proof electric motor, and many other ingenious details ensure that all components can withstand even harsh ambient conditions for a very long time. With over three decades of experience in renewable energies, Bosch Rexroth combines know-how with extensive research and development activities. The resulting precision and reliability are an important prerequisite for the economically viable production and use of photovoltaic systems, and can be found in numerous Bosch Rexroth solutions: in automation as well as in tracking, mounting and assembly systems. For our customers in the highly dynamic photovoltaic industry, this means gaining a competitive edge.